I write you after proper cosideration that a telephone conversation maynot be an ideal medium to contact you. I am Edes Abebe, A cousin and personal assistant to the late Chief Mrs. Stella Obasanjo, the late wife of the president Olusegen Obasanjo of Nigeria who died in Spain on Sunday the 23rd of Oct 2005 after an unsuccessful surgery operation. As the cousin and personal to the deceased I handle in confidence some of her affairs, mostly properties, Investment and funds both domestic and overseas. In this case my sister/client who left Thirty million GreatBritish Pounds sterling (30,000,000.00) and so many other investments with my signatory abroad for her personal reason. The family will call me to account for her properties and funds overseas after Two years of her death according to the tradition our people which will happen any moment from now as its past Two years. So at this juncture, I seek your consent to write the bank and present you as a beneficiary of some part of the fund which has been approved for transfer by my late sister in her fund deposited in a particular bank,since i have all the documents regarding the deposited funds which I will disclose to you as we progress in this transaction. All we require from you is 100% trust, and honest corporations to enable us see this deal through, and I also guarantee you that this transaction will be executed under a legitimate process that will protect us from any breach of the law. The sharing formula will be 60% for us 30% for you and 5 % for charity to my client's pet project CHILD CARE TRUST FOUNDATION, for the less privileged and disabled children and the remaining 5% will be set aside for any expenses incurred during the course of transfer process. 6. Tel number/fax so that we can speedy up the transaction before i will be called to give account of the assets. Subject: I NEED YOUR URGENT HELP. Please read this slowly and carefully, as it may be one of the most important emails you ever get. I am Mrs Rose Green from England, I was married to Late Mr.Sean Green. He work with Cairn Energy PLC oil and gas exploration and Production Company based in the United Kingdom and Australia and was also a seasoned contractor in the Baltic Region. He died on 29 July, 2006 in Paris. Until my husband's death he was consultant to several oil and gas industries. He had a sojourn in the United States and so many other countries before he came to Cairn Energy PLC oil and gas exploration and Production Company based in the United Kingdom and Australia. We were married for seven years without a child. After his death I decided not to re-marry or get a child outside my matrimonial home due to my christain belief. When my late husband was alive, he deposited the sum of USD $1,800,00.00 (One Million Eight hundred thousand Dollars) in a bank here in London, which documents where discovered after his death by the company and sent to me as the only survivor. My Doctor told me that I would not last long due to my complicated cancer. Having known my condition I decided to donate this funds to better the lives of the less privileged. I need an honest and trust worthy individual that will help utilize this money in accordance with my instruction. You and your family are entitle to take 10% of this funds and 5% for any expenses you may incure during the transfer process, while 85% of the funds will be used in funding religious organizations, orphanages and less privileged propagating the word of God. I took this decision because I don't have any child that will inherit this money and my husband's relatives are very unkind to me and I don't want my husband's hard earned money to be misused or wasted. I am not afraid of death hence I know where I am going. I know that I am going to be in the bosom of the Lord. Exodus 14 VS 14 says that the lord will fight my course and I shall hold my peace. As soon as I receive your reply I shall give you my laywer's contact here for legitimacy, he will also issue you a letter of authorization that will empower you as the original beneficiary of this fund. I want you to always pray for me, Any delay in your reply will give me room in sourcing for another individual for this same purpose. If you are not interested,kindly pardon me for contacting you. My regards to you and your family. My warmest greeting to you in the name of the Lord. I am writing this letter with due respect and heartful of tears since we have not known or met ourselves previously. I am Amira Diaby and I inherited this sum from my late father who died in recent crisis in Cote d'Ivoire. I wish to request for your assistance in investing this sum in lucrative venture or manufacturing and real estate management in your country. I have Eight million,Seven hundred thousand United State Dollars. USD($8,700,000) to invest and I will require your assistance in receiving the fund in your account. I will be glad to give you some reasonable percent from the total sum for your assistance. Before the death of my father on September 14/9/2005, he gave me all the necessary legal documentation concerning the deposit of the fund in the bank, I am 21 years old and a university undergraduate and really don't know what to do. Now I want an account overseas where I can transfer this funds and after the transaction I will come and reside permanently in your country till such a time that it will be convinient for me to return back home if I so desire. This is because I have suffered a lot of set backs as a result of incessant political crisis here in Ivory coast. The death of my father actually brought sorrow to my life. I also want to invest the fund under your care because I am ignorant of business world. Please, consider this and get back to me as soon as possible. Immedaitely I confirm your willingness, I will send to you my picture and also give you more details about myself and the bank where my late father deposited the fund, so that you can reach the bank and confirm the existence of the fund as well, because seeing is believing. You have been been approved to claim a total sum of £200,000 GBP POUNDS STERLING. From the Vodafone Online/Beijing Olympic Web email draws. Due to possible mix up of some numbers and email contacts, we ask that you keep this award strictly from public notice until your claim has been processed and your money remitted. This is part of our security protocol to avoid double claiming or unscrupulous acts by some participants of this program. This is from a total cash prize of Two hundred million pounds (£2,000,000 GBP) Shared among the ten international winners in the 1st category. Thank you for your prompt reply to the mail which has raised my confidence levels when dealing with a new person whom i have never seen before. It is nice to know that you have interest in me in spite of the age difference. Greeting and compliment of the season to you and your relatives. I hope you are a highly respected personality with records of proven integrity and God fearing. My name is Maria Banko, 23yrs of age, 172cm by height, 58 kg by weight and attractive looking. Mysteries has gone in my life while life has become restless for me in this western part of Africa years back when i lost my daddy with result of poison confirmed by the medical doctor in the hospital where he breath his last breath. My father was a wealthy merchant dealing with cocoa business both local and abroad. He took advantage of his business to keep the sum of Five point five million US dollars ($5.5m) in a metal box which was kept in a private security company as family valuables for diplomatic transfer. Interestingly, he used me as his next of kin and also has in my position the original proof issued to him by the security company. He recovered this money from his business, a trouble began when my uncle suspect that my father is not disclosing all his affairs to him as before. This mistrust began when he discovered that my father is proposing a new cocoa firm with one of leading company here in Abidjan Cote D Ivoire. As a result of this threaten my father decided to withdrawn all his money from the Bank as been advised by some of his business fellow and kept it into a metal box for security reason and deposited in a securrity company for diplomatic transfer. It is 2 in 1 because during that time there is also war in the country while most of the banks has been destroyed and luth by the rebels, this is what give my late daddy the opportunity to accept the advise been given by his collegues and he decide to safe keep the fund through security company channel. He was later poisoning by his brother that is my (Uncle) Before this, he revealed to me the reasons of his being hatred and explain to me in details the issue of the deposit in the security company and he gave to me all the proof of the said consignment for refference. Due to the over thinking my mother derive hypertension and she died with the history of parylyzed. He instructed me that if he dies, that I should look for a foreign partner of my choice to help me retieve this consignment and deposit the money in his Account after we have both agree to be husband/business partner. Since then I was out of school and went into hiding which make me not to complete my education. I know quite alright that we have not see or meet each other but with faith and clear mind i am disclosing to you details of myself which i believe it will turns to real and long term relationship soon. I promise to offer you 20% of the total fund and pay you back all expenses you may spent during processing if you may agree to bear the expenses that we be needed. If you find this proposal interesting, do forward to me urgently your full name, address, telephone/fax number and the photo page of your international passport, which I shall use to apply to the security company for change of ownership to your name and particulars as my accredited representative which on approval shall authorize you to stand in and claim the consignment. I have the courage to look for a reliable and Honest Person who will be capable for this important business Transaction,believing that you will never let me down either now or in Future. The owner of this account is JOSEPH F. GRILLO, foreigner and he is the Manager of petrol chemical service, a chemical engineer by Proffession. And my investigation proved to me as well that his company does not know anything about this account.I want to transfer this money into a safe foreign account abroad but I Don't know any foreigner,I know that this message will come to you as a surprise as we don't know ourselves before, but be sure that it is real And A Genuine business.Hope that you will never let me down in this transaction, at the conclusion of this business, you will be giving 30% of the total amount, 70% will be for me. I look forward to your earlier reply by email for more details Thanks. How are you and how about your family? Hope fine, Meanwhile, I am Mr.Alfred Sheyi, the chief billing exchange accountant manager of Altalantic bank, ouaga,bf West Africa. I am contacting you for anurgent business transaction. There is an account open in this bank in 1999 and since 2001 nobody has operated on this account again. After going through some old files in the records, I discovered that if I do not remit this money out urgently, it would be forfeited fornothing. The owner of this account is Mr Raymond Becks, a foreigner, and a miner at Kruger Gold Company, a Geologist by profession and he died since 2000. No other person knows this account or anything concerning the fund, the account has no other beneficiary and my investigation proved to me aswell thatthis company does not know anything about this account and the money involved is ten Million United States Dollars $10,000.000.00 Million only. approved to a local bank here in Burkina Faso, but can only be approved to any foreign account because the money is in United States Dollars and the former owner Mr.RAYMOND BECK is a foreigner too. I know that this message will come to you as surprise as we don't know ourselves before. My dear, be sure that this is a real and genuine business transaction. I only got your contact information from my secretary who operates computer, with believe in God that you will never let me down in this business, considering my position as a public servant, You are the only person that I have contacted you in this business, so please reply urgently so that I will inform you the next step to take immediately. You will only need you to send your private telephone and fax numbers includingthe full details of your account information to be used for the deposit. And I will fly to your country for withdrawal and sharing and for other investment in your kind control, Meanwhile, I am contacting you because of the need to involve a foreigner with foreign account and foreign beneficiary. I need your full co-operation to make this work fine because the management is ready to approve this payment to any foreigner who has correct information of this account, which I will give to you as soon as you indicate your sincerity to co-operate with me, and capability to handle such amount in sinceririty ofpurpose and strict/confidence and trust according to my instruction and advice for our mutual benefit because this opportunity may never come again inmy life. I also need a truthful and God fearing person in this business because I don't want to make a mistake so I need your strong assurance and trust.With my position in the office I don't want anything that will jeopardize my job,so I advice that we should make secrecy and confidentiality as our primary working condition, bearing in mind that I am a public servant. I will use my position and influence to effect legal approvals and onward transfer of this money to your account with appropriate clearance forms of the ministries and foreign exchange department. At the conclusion of this business, you will be giving 35% of the total amount, 60% will be for me, while 5% will be for expenses both parties might have incurred on the process of the transfer. I look forward to your earliest reply,Please i will like you to reply me with this address:alfred_sheyi@myway.com. I CAN'T IMAGINE HOW YOU WILL FEEL RECEIVING A SUDDEN BUSINESS LETTER FROM A REMOTE COUNTRY IN FAR AWAY BURKINA FASO WEST AFRICA AND PROBABLY FROM SOME ONE YOU HAVE NOT CLOSELY RELATED WITH. BUT ALL THE SAME, I BELIEVE WE DO NOT NEED TO BE OF BLOOD RELATIVES BEFORE WE CAN ESTABLISH CORDIAL/BUSINESS RELATIONSHIP. HAVING SAID THIS, I THINK IT IS VERY IMPORTANT AT THIS JUNCTURE TO INTRODUCE MYSELF TO YOU. I AM MR.ROYAUME MOSSI THE DIRECTOR IN CHARGE OF AUDITING AND ACCOUNTING SECTION OF AFRICAN DEVELOPMENT BANK (ADB) OUAGADOUGOU BURKINA-FASO WEST AFRICA . IT IS MY PLEASURE TO SOLICIT YOUR ASSISTANCE IN THIS BUSINESS PROPOSAL. I AM CONTACTING YOU BECAUSE, I DO NOT WANT TO TRANSACT THE BUSINESS WITH ANYBODY WHO IS KNOWN TO ANY STAFF OF THIS BANK OR ANYBODY AROUND HERE TO AVOID ANY POSSIBLE BLACKMAIL OR LEAKAGE AT THE END OF THE TRANSACTION. IN FACT I COULD HAVE DONE THIS DEAL ALONE BUT BECAUSE OF MY POSITION IN THIS COUNTRY AS A CIVIL SERVANT(A BANKER )WE ARE NOT ALLOWED TO OPPERATE A FOREIGN ACCOUNT AND WOULD EVENTUALLY RAISE AN EYE BROW ON MY SIDE DURING THE TIME OF TRANSFER BECAUSE I WORK IN THIS BANK. I WILL NOT FAIL TO INFORM YOU THAT THIS TRANSACTION IS 100% RISK FREE. ON SMOOTH CONCLUSION OF THIS TRANSACTION, YOU WILL BE ENTITLED TO 40% OF THE TOTAL SUM AS GRATIFICATION, WHILE 5% WILL BE SET ASIDE TO TAKE CARE OF EXPENSES THAT MAY ARISE DURING THE TIME OF TRANSFER AND ALSO TELEPHONE BILLS, WHILE 55% WILL BE FOR ME AND MY PARTNER. PLEASE, YOU HAVE BEEN ADVICED TO KEEP "TOP SECRET" AS I AM STILL IN SERVICE AND INTEND TO RETIRE FROM SERVICE AFTER WE CONCLUDE THIS DEAL WITH YOU. I LOOK FORWARD TO RECEIVE YOUR IMMEDIATE RESPONSE. Subject: TREAT URGENTLY AND CONFIDENTIAL. FROM THE DESK OF MERBETH AARON. HOW ARE YOU, FIRST I WILL EXPLAIN MY SELF IN BRIEF FOR YOU BEFORE WE PROCEED. I AM THE MANAGER OF BILL AND EXCHANGE AT THE FOREIGN REMITTANCE DEPARTMENT OF BANK OF AFRICA (BOA) I AM WRITING TO SEEK YOUR INTEREST OVER A BUSINESS , IN MY DEPARTMENT WE DISCOVERED AN ABANDONED SUM OF $20M US DOLLARS ( TWENTY MILLION US DOLLARS). IN AN ACCOUNT THAT BELONGS TO ONE OF OUR FOREIGN CUSTOMER ( MR. ANDREAS SCHRANNER FROM MUNICH, GERMANY) WHO DIED ALONG WITH HIS ENTIRE FAMILY IN NOVEMBER15TH 2000 IN A PLANE CRASH. SINCE WE GOT INFORMATION ABOUT HIS DEATH, WE HAVE BEEN EXPECTING HIS NEXT OF KIN TO COME OVER AND CLAIM HIS MONEY BECAUSE WE CANNOT RELEASE IT UNLESS HIS NEXT OF KIN OR RELATIVE APPLIES FOR IT AS NEXT OF KIN OR RELATION TO THE DECEASED AS INDICATED IN OUR BANKING GUIDELINES BUT UNFORTUNATELY WE LEARNT THAT ALL HIS SUPPOSED NEXT OF KIN OR RELATION DIED ALONGSIDE WITH HIM AT THE PLANE CRASH LEAVING NOBODY BEHIND FOR THE CLAIM. IT IS THEREFORE UPON THIS DISCOVERY THAT I AND TWO OTHER OFFICIALS IN MY DEPARTMENT NOW DECIDED TO ESCAPE WITH THE FUND, AND AS SUCH WE VIAL TO MAKE THIS BUSINESS PROPOSAL TO YOU SO THAT MY BANK WILL RELEASE THE FUND INTO YOUR ACCOUNT AS THE NEXT OF KIN TO OUR BANK DECEASED CUSTOMER FOR SAFETY AND SUBSEQUENT DISBURSEMENT SINCE NOBODY IS COMING FOR CLAIMS AND WE DON'T WANT THIS MONEY TO GO INTO THE BANK TREASURY. INFECT I KNOW THE FUND WILL NOT EVEN GO INTO THE BANK TREASURY, BUT OUR TOP BANK OFFICIALS (DIRECTORS) WILL ONLY SHARE IT AMONG THEMSELVES INTO THEIR ACCOUNTS. THE BANKING LAW AND GUIDELINE HERE IN BURKINA FASO STIPULATES THAT IF ANY CUSTOMER ACCOUNT OR PROPERTY REMAINS UNSERVICEABLE OR DORMANT, AND UNCLAIMED AFTER FIVE YEARS, THE ACCOUNT WILL BE CONFISCATED AND TRANSFERRED INTO THE BANK TREASURY AS UNCLAIMED BILL. THE REQUEST OF FOREIGNER AS NEXT OF KIN IN THIS BUSINESS IS OCCASIONED BY THE FACT THAT THE CUSTOMER WAS A FOREIGNER AND BURKINABE CANNOT STAND AS NEXT OF KIN TO A FOREIGNER. WE AGREE THAT 30% OF THIS MONEY WILL BE FOR YOU AS FOREIGN PARTNER, IN RESPECT TO THE PROVISION OF A FOREIGN ACCOUNT, AND YOUR IMENSE CONTRIBUTION TO CHAMPION THE COURSE OF TRANSFERRING THE FUND TO YOUR ACCOUNT. 10 % WILL BE SET ASIDE FOR EXPENSES INCURRED BY THE BOTH PARTY DURING THE BUSINESS AND 60 % WOULD BE FOR ME AND MY COLLEAGUES. THERE AFTER I AND MY COLLEAGUES WILL VISIT YOUR COUNTRY FOR DISBURSEMENT ACCORDING TO THE PERCENTAGES INDICATED. THEREFORE TO ENABLE MY BANK TRANSFER THE FUND INTO YOUR ACCOUNT,I WILL SEND TO YOU THE TEXT OF APPLICATION WHICH YOU WILL SEND TO MY BANK AS NEXT OF KIN TO THE DECEASED CUSTOMER AND THAT WILL BE WHEN YOU INDICATE YOUR INTEREST IN THE BUSINESS, YOU MUST APPLY FIRST TO THE BANK AS RELATIONS OR NEXT OF KIN OF OUR BANK DECEASED INDICATING YOUR BANK NAME, YOUR BANK ACCOUNT NUMBER, YOUR PRIVATE TELEPHONE AND FAX NUMBER FOR EASY AND EFFECTIVE COMMUNICATION AND LOCATION WHERE IN THE MONEY WILL BE REMITTED. UPON RECEIPT OF YOUR REPLY, I WILL SEND TO YOU BY FAX OR EMAIL THE TEXT OF THE APPLICATION. I WILL NOT FAIL TO BRING TO YOUR NOTICE THAT THIS TRANSACTION IS RISK-FREE AND THAT YOU SHOULD NOT ENTERTAIN ANY ATOM OF FEAR AS ALL REQUIRED INFORMATIONS WILL BE PERFECTLY MADE FOR YOU TO CHAMPION THE COURSE OF THE TRANSACTION WITH MY BANK WITHOUT ANY HITCH OR RISK . My name is Mr. Song Li le I work with the Hang Seng Bank.There is the sum of $19,500,000.00 in my bank"Hang Seng Bank",Hong kong. I wish to make a transfer involving a huge amount of money worth $19,500,000.00 .I do solicit for you assistance in effecting this transaction. I intend to give 30% of the total funds as compensation for your assistance.I will notify you on the full transaction on receipt of your response if interested,and i shall send you the details and necessary procedures with which to make the transfer. Thank you very much for your response, and your interest in this transaction. Let me start by introducing myself again.I am Mr. SONG LI LE director of operations of the Hang Seng Bank Ltd.I have an obscured business suggestion for you. Before the U.S and Iraqi war our client Colonel Sadiq Uday who was with the Iraqi forces and also businessman, made a numbered fixed deposit for 18 calendar months, with a value of Nineteen millions Five Hundred Thousand United State Dollars only in my branch.Upon maturity several notices was sent to him, even during the war which began in 2003. Again after the war another notification was sent and still no response came from him. We later found out that the Colonel along with his wife and only daughter had been killed during the war in a bomb blast that hit their home. What bothers me most is that according to the laws of my country at the expiration 5 years the funds will revert to the ownership of the Hong Kong Government if nobody applies to claim the funds. Against this backdrop, my suggestion to you is that I will like you as a foreigner to stand as the next of kin to Colonel Sadiq Uday so that you will be able to receive his funds. There is no risk involved at all in this matter, as we are going to adopt a legalized method and the attorney will prepare all the necessary documents. Please endeavor to observe utmost discretion in all matters concerning this issue. Once the funds have been transferred to your nominated bank account we shall then share in the ratio of 70% for me, 30% for you. And finally after that I shall provide you with more details of this operation. I NEED YOUR URGENT ASSISTANCE AND UNDERSTANDING IN THIS PROJECT.NOT A SURPRISED MAIL. I AM THE MANAGER OF BILL AND EXCHANGE AT THE FOREIGN REMITTANCE DEPARTMENT OF AFRICAN DEVELOPMENT BANK (ADB). I CRAVE YOUR INDULGENCE AS I CONTACT YOU IN SUCH A SURPRISING MANNER. BUT I RESPECTFULLY INSIST YOU READ THIS LETTER CAREFULLY AS I AM OPTIMISTIC IT WILL OPEN DOORS FOR UNIMAGINABLE FINANCIAL REWARDS FOR BOTH OF US. IN MY DEPARTMENT WE DISCOVERED AN ABANDONED SUM OF TEN MILLION,FIVE HUNDRED THOUSAND US DOLLARS (US$10.5M) ONLY , IN AN ACCOUNT THAT BELONGS TO ONE OF OUR FOREIGN CUSTOMER WHO DIED ALONG WITH HIS ENTIRE FAMILY IN A PLAN CRASH. SINCE WE GOT INFORMATION ABOUT HIS DEATH, WE HAVE BEEN EXPECTING HIS NEXT OF KIN TO COME OVER AND CLAIM HIS MONEY BECAUSE WE CANNOT RELEASE IT UNLESS SOMEBODY APPLIES FOR IT AS NEXT OF KIN OR RELATION TO THE DECEASED AS INDICATED IN OUR BANKING GUIDELINES BUT UNFORTUNATELY WE LEARNT THAT ALL HIS SUPPOSED NEXT OF KIN OR RELATION DIED ALONG WITH HIM AT THE PLAN CRASH LEAVING NOBODY BEHIND TO COME FOR THE CLAIM. IT IS THEREFORE UPON THIS DISCOVERY THAT I NOW DECIDED TO MAKE THIS BUSINESS PROPOSAL TO YOU SO THAT THE MONEY COULD BE RELEASED TO YOU AS THE NEXT OF KIN FOR SAFETY AND SUBSEQUENT DISBURSEMENT SINCE NOBODY IS COMING FOR IT AND I DONT WANT THIS MONEY TO GO INTO THE BANK TREASURY AS UNCLAIMED BILL. THE BANKING LAW AND GUIDELINE HERE STIPULATES THAT IF SUCH MONEY REMAINED UNCLAIMED AFTER FIVE YEARS, THE MONEY WILL BE TRANSFERRED INTO THE BANK TREASURY AS "UNCLAIMED FUND". THE REQUEST FOR A FOREIGNER AS NEXT OF KIN IN THIS BUSINESS IS OCCASIONED BY THE FACT THAT THE CUSTOMER WAS A FOREIGNER AND A BURKINABE CANNOT STAND AS NEXT OF KIN TO A FOREIGNER. WE AGREE THAT 30% OF THIS MONEY WILL BE FOR YOU AS A FOREIGN PARTNER, IN RESPECT TO THE PROVISION OF A FOREIGN ACCOUNT , 10% WILL BE SET ASIDE FOR EXPENSES INCURRED DURING THE BUSINESS AND 60% WOULD BE FOR ME. THERE AFTER I WILL VISIT YOUR COUNTRY FOR DISBURSEMENT ACCORDING TO THE PERCENTAGE INDICATED. THEREFORE TO ENABLE THE IMMEDIATE TRANSFER OF THIS FUND TO YOU AS ARRANGED, YOU MUST APPLY FIRST TO THE BANK AS RELATION OR NEXT OF KIN OF THE DECEASED INDICATING YOUR BANK NAME,YOUR BANK ACCOUNT NUMBER, YOUR PRIVATE TELEPHONE AND FAX NUMBER FOR EASY AND EFFECTIVE COMMUNICATION AND LOCATION WHEREIN THE MONEY WILL BE REMITTED. UPON RECEIPT OF YOUR REPLY,I WILL SEND TO YOU BY FAX OR EMAIL THE TEXT OF THE APPLICATION. I WILL NOT FAIL TO BRING TO YOUR NOTICE THAT THIS TRANSACTION IS HITCH FREE AND THAT YOU SHOULD NOT ENTERTAIN ANY ATOM OF FEAR AS ALL REQUIRED ARRANGEMENTS HAVE BEEN MADE FOR THE TRANSFER. I NEED A CAPABLE AND ABLE PERSON WHO WILL HANDLE AND MANAGE THIS FUNDS BECAUSE IT IS NOT A SMALL AMOUNT OF PROJECT. I am the auditing manager of BANK OF AFRICA (BOA) Ouagadougou, BURKINA FASO,WEST AFRICA. I have the courage to look for a reliable and Honest Person who will be capable for this important business Transaction, believing that you will never let me down either now or in Future. The owner of this account is MR RON MORRIS, a foreigner and he is the Manager Of petrol chemical service, a chemical engineer by Proffession.He died with his entire family, they were among the victims of December 25, 2003 Air-Crash Incident in Benin Republic. My Investigation as the bank auditing manager proved to me as well that his company does not know anything About this account. I want to transfer this fund into a safe foreign account abroad and I know that this message will come to you as a surprise as we don't know ourselves before,but be sure that it is real And A Genuine business. Hope that you will never let me down in this transaction. At the conclusion of this business,you will be giving 40% of the total amount, 50% will be for me and 10% for any expenses the may accured during the transaction. I looking forward to your earliest reply for more details. I want to bring to your knowledge of a very lucrative business opportunity that I have. Well I work as a fiduciary agent that disburses funds to various contract beneficiaries under the Standard Bank of Nigeria (SB); I have a pending deal that can be of great and mutual benefits to you and me i.e. if you promise to keep optimum confidentiality. Meanwhile I do foresee the surprise this letter will bring to you as it comes from a stranger, but be assured that it comes with the best of intentions not SCAM. I got your contact from a search into the Internet and was inspired to seek your cooperation. I am aware of the risks involved in sending this letter by email, therefore I ask that you consider the factors below and keep it strictly confidential. However, if you are unable to meet my demand, kindly discard of it. I am contacting you through this means due to the urgency required for us to immediately transfer the said funds in the consignments from United Kingdom where the fund are currently kept in a vault of a private security firm. Meanwhile the amount of the funds lodged is in excess of USD33M (Thirty Three Million United State Dollars).I am willing to offer you 25% of the total sum as compensation for your effort/input after you successfully secure the funds in your custody overseas and also map out 5% for any expenses that may arise. Also note that an agreement would be drafted in respect of this. I will invest my share into any viable business you suggest. I want to assure you that this business proposal is 100% risk free as i have done my homework properly. I quite believe that you will protect my interest by taking this deal strictly confidential, as i am still in government service, which i intend to retire from in full honor. Thanks for your urgent response to my mail and your willingness to assist me in this business transaction that is going to be of great benefit for the both of us. Secondly the consignments contains the said $33million is presently deposited with a security company in London. I also want you to know that this business is 100% risk free and you have nothing to worry about. I want you to understand that there are no risks involved anymore because all the risk in getting this package to the U.K has already been taken care of by me. All I need is someone that is capable enough to clear the package till my arrival in your country and we will invest the said funds into a good partnership investment. To actualize this process I shall forward to you all the legal documents for the deposit and shipment of the aforementioned package that contains the $33million. Thereafter I shall look for a prudent attorney that will prepare the power of attorney and legalize the transfer of ownership to you as the bona-fide beneficiary of the package. Consequent upon the receipt of the completed documents from the attorney, I shall write a formal letter of authorization along other documents to the courier company, instructing them to release and deliver the package to you as the trustee. As soon as the company acknowledges my application, they shall notify you on how to proceed in delivering the consignments to you in your address. To forestall and cement our agreement on the terms of sharing, our understanding is that the entire sum of $33 million US Dollars shall be shared in the ratio of 25%/70% respectively,5% for any expenses that may arise. To ensure that this is clearly understood by both parties, a memorandum of understanding (MOU) shall be drafted by the attorney to legally bind us. This is paramount because I spent all most all the money I have work all my life to ship and deposit this consignmets with the courier company. CAN I TRUST YOU? Importantly, be informed that we did not disclose the true content of the consignments to the courier company; what they have on their records is family valuables, so please note. While I look forward to your prompt response I want you to know that this transaction is 100% risk free and as such, will require your maximum co-operation to actualize it for our mutual benefits. I shall send you all the documents as soon as I hear from you. Your mail and the information you have provided gave me light and joy that this fund will be safe in your hands. Like I told you in my previews email this transaction is 100%. Check your attached file, you shall find the agreement that will bind us together for you to endorse and return to me via attachment and also my passport copy. Meanwhile I have gotten a prudent lawyer who has promise to help us arrange those documents in your name. Here is the contact of the attorney. Please contact him as soon as possible for the arrangement of the change of beneficiary and the power of attorney in your name. Please my good friend I hope that you shall not betray me at the end of this transaction as I already taken you like my own blood brother. I will be waiting for your urgent call or response. I welcome you once again in this side of Africa, I am very happy for your willing to assist me in this transaction, I contacted you to assist me to claim and secure this fund, based on a practical fate Really, well no one is coming for the claim, Since my late client died with all his entire family and nobody left to claim the fund. My happiness now is you have the same last name with my late client Engr. Mark Chance, and hence I forwarded your name to the bank their will transfer the total fund to you and immediately this fund transferred to you, I will fly down to your country for our sharing, Meanwhile I have not seen you for the first time, but I contacted you on trust believing that you will not betray me or run away with this fund at the end of this claim, As a matter of fact, I need your assistance to make this transaction done successfully. Meawhile, all the necessary information relating to this issue has been taken to ensure a smooth and successful transfer of this fund to your designated account for our mutual benefit. I believe that it was God that brought this very opportunity for I and you, As it may interest you to know a little about me. I am Barrister Samuel Benko and I am a member of the Knight of St John, I live on No.21 Ogui de caise off Ovim Lome-Togo. I married to a lovely wife and blessed with children, a boy and a girl. My wife Mrs. Naomi Benko, She is a nurse and works with the general hospital here in Lome Togo. Manwhile, we all will come over to your country at the conclusion of this transaction. I have been working in law firm for so many years and I will not tarnish my image as well as my reputation here in the country, I would advise you to keep this inheritance claim top-secret until this fund transferred to you. I want to present you as the next of kin to my late client Engr. Mark Chance, I will release all the informations to you enable the bank release and transfer the fund to you. I want you to understand that this transaction is 100% risk-free as far as am concern, I am here to guide you with all the necessary informations to ensure a smooth and successful transfer of this fund to you. This transaction will not last more than 14 bank working days, in as much as you would be working towards my directives. On the conclusion of this transaction, I suggest that our sharing ratio will be this, 50% will be for me and 50% will be for you, I await to hear your own opinion concern the sharing ratio. However, I expecting your urgent response immediately for more informations. As soon as I hear from you, I would then forward the Text Of Application Form, for you to fill and send to the bank were the fund was deposited for applying to the claim, But as a matter of fact, I would like to know a little about you before sending you the details of Text Of Application Form. D) Your direct telephone number.........? With these informations, I would be able to understand whom am dealing with and also use it to provide some neccesary documents for the success of this claim. Call me on my direct telephone number listed here +228-9082080. Waiting for your ungent respond. My regards to you and your family and remain blessed. Attention please, I am,The bank manager in bank of africa (BOA) BURKINA FASO WEST AFRICA BRANCH. I am contacting you based on Trust and confidentiality that you will keep this as top secret.don't be scared or surprised, i am the manager in BANK OF AFRICA and i have an opportunity to transfer sum of US$10.5MILLION (TEN MILLION FIVE HUNDRED UNITED STATE DOLLARS) I have the courage to look for a reliable and Honest Person who will be capable for this important business Transaction,believing that you will never let me down either now or in Future. And my investigation proved to me as well that his company does not know anything about this account.I want to transfer this money into a safe foreign account abroad but I Don't know any foreigner,I know that this message will come to you as a surprise as we don't know ourselves before, but be sure that it is real And A Genuine business. Hope that you will never let me down in this transaction, at the conclusion of this business, you will be giving 30% of the total amount, 70% will be for me. I look forward to your earlier reply by email for more details Thanks. I am writing this letter in confidence believing that if it is the wish of God for you to help me and my family, God almighty will bless and reward you aboundantly and you would never regreat this.I am a female student from University of Burkina faso, Ouagadougou. I am 25 yrs old. I'd like any person who can be caring, loving and home oriented. I will love to have a long-term relationship with you and to know more about you I would like to build up a solid foundation with you in time coming if you can be able to help me in this transaction. Well, My lovingly Parents died two Years ago and left I and my junior brother behind. My late father was a king, which our town citizens titled him over sixteen years before his death.I was a princess to him and I am the only person who can take care of his wealth now because my junior brother is still young . Now am matured to face the life.I know all my father's wealth. He left the sum of USD 5,000.000 Dollars (Five Million US Dollars) in a Security Company here in Burkina Faso In West African Country. This money was annually paid into my late fathers account from Shell petroleum development company(SPDC)and chevron oil company operating in our locality for the compensation of youth and community development in our jurisdiction. I don't know how and what I will do to invest this money somewhere in abroad, so that my father's kindred will not take over what belongs to my father and our family, which they were planning to do without my present because I am a female as stated by our culture in the town. Now,i urgently need your humble assistance to move this money from the security company to your bank account, That is why I felt happy when I saw your contact because I strongly believe that by the grace of God, you will help me to invest this money wisely. I am ready to pay 20% of the total amount to you if you help me in this transaction and another 10% interest per Annual After Income to you, for handling this transaction for us, which you will strongly have absolute control over. If you can handle this project sincerely and also willing to assist me in lifting this fund, kindly reach me. Please, note that this transaction is 100% risk free and I hope to commence the transaction as quick as possible, I will send you my Picture as soon as I hear from you. How are you and how about your family? Hope fine, Meanwhile, I am Mr.Alfred Sheyi, the chief billing exchange accountant manager of Altalantic bank, ouaga,bf West Africa. I am contacting you for anurgent business transaction. There is an account open in this bank in 1999 and since 2001 nobody has operated on this account again. After going through some old files in the records, I discovered that if I do not remit this money out urgently, it would be forfeited fornothing. I am only contacting you as a foreigner because this money cannot be approved to a local bank here in Burkina Faso, but can only be approved to any foreign account because the money is in United States Dollars and the former owner Mr. RAYMOND BECK is a foreigner too. I know that this message will come to you as surprise as we don't know ourselves before. WE AGREE THAT 30% OF THIS MONEY WILL BE FOR YOU AS FOREIGN PARTNER, IN RESPECT TO THE PROVISION OF A FOREIGN ACCOUNT, AND YOUR IMENSE CONTRIBUTION TO CHAMPION THE COURSE OF TRANSFERRING THE FUND TO YOUR ACCOUNT. 10 % WILL BE SET ASIDE FOR EXPENSES INCURRED BY THE BOTH PARTY DURING THE BUSINESS AND 60 % WOULD BE FOR ME AND MY COLLEAGUES. I wish to make a transfer involving a huge amount of money worth $19,500,000.00 .I do solicit for you assistance in effecting this transaction.I intend to give 30% of the total funds as compensation for your assistance.I will notify you on the full transaction on receipt of your response if interested,and i shall send you the details and necessary procedures with which to make the transfer. I NEED YOUR URGENT ASSISTANCE AND UNDERSTANDING IN THIS PROJECT. NOT A SURPRISED MAIL. THERE AFTER I WILL VISIT YOUR COUNTRY FOR DISBURSEMENT ACCORDING TO THE PERCENTAGE INDICATED. THEREFORE TO ENABLE THE IMMEDIATE TRANSFER OF THIS FUND TO YOU AS ARRANGED, YOU MUST APPLY FIRST TO THE BANK AS RELATION OR NEXT OF KIN OF THE DECEASED INDICATING YOUR BANK NAME,YOUR BANK ACCOUNT NUMBER, YOUR PRIVATE TELEPHONE AND FAX NUMBER FOR EASY AND EFFECTIVE COMMUNICATION AND LOCATION WHEREIN THE MONEY WILL BE REMITTED. UPON RECEIPT OF YOUR REPLY,I WILL SEND TO YOU BY FAX OR EMAIL THE TEXT OF THE APPLICATION.I WILL NOT FAIL TO BRING TO YOUR NOTICE THAT THIS TRANSACTION IS HITCH FREE AND THAT YOU SHOULD NOT ENTERTAIN ANY ATOM OF FEAR AS ALL REQUIRED ARRANGEMENTS HAVE BEEN MADE FOR THE TRANSFER. I NEED A CAPABLE AND ABLE PERSON WHO WILL HANDLE AND MANAGE THIS FUNDS BECAUSE IT IS NOT A SMALL AMOUNT OF PROJECT. Before I introduce myself, I wish to inform you that this letter is not a hoax mail and I urge you to treat it with the seriousness it deserves. This letter must come to you as a big surprise, but I believe it is only a day that people meet and become great friends and business partners. This is a personal mail directed to you and I request that it be treated as such. I would like you to stand as the next of kin to my deceased client who made some deposits of 25m US dollars at a monthly roll-over interest rate of 10% per annum with the bank of africa ouagadougou burkinafaso. He died without any registered next of kin and as such the funds now have an open beneficiary mandate. Apparently, this fund does not have any beneficiary and no family member has surfaced as he lived in asia all his life and never bothered about extended families. The bank thereafter contacted me to find the family of the deceased especially now that the only person that was suppose to be his beneficiary died long time ago before the deposit. And that was his wife. All my effort to locate his families in New Zealand, Australia etc proved abortive and knowing that this fund shall be converted to UNCLAIMED DEPOSIT and therefore be forfeited if nobody comes forward to lay claim to the deposit before the end of this financial quarter, as is the practice and also indicated in the EU banking guidelines. The DEAL is that I intend to present you as the family member to the deceased and have you apply for the claim of this fund. Well, I know very well that the bank may want to verify and undertake its normal bureaucratic investigation, but I assure you that with all the legal, bank and personal papers of the deceased in my possession, and knowing fully well that I am the only one who can give unquestionable testimony on the deceased's investments and property declaration, it would be pretty easy if you co-operate with me as a team to claim this fund. Upon your acceptance to my proposition, I shall proceed to the burkinafaso High Court to obtain the Legal Clearance in your name as the replacement Next of Kin. I shall thereafter send to you all the bank documents and details about the deceased and instruct you on how to apply formally for the process of this claim. Upon your application, the bank shall officially contact you to establish this claim. And of course, I shall be contacted immediately your application is tendered to the bank to testify if I know about your motives. Then, the claim begins. In a matter of five working days the initial Principal of 25m US dollars shall be liquidated with the interest. The total we should expect after the liquidation can't be less than 45m US dollars. We shall share this fund among ourselves 50/50 as we shall be involved equally in all aspects of the claim. However, your bank account shall be used as the beneficiary's account and you will in turn transfer my share to my account in scotland. You may establish a fresh or zero account for this purpose. I seek your understanding to have you stand as the Beneficiary/Next of Kin to the deceased. Do not be bothered as we will carefully and legally work out all necessary documents in your favor as the new Beneficiary/Next-of-Kin to the Estate. I want to count on you as a person of respect and honest disposition and hope that you will handle this transaction with all maturity and confidentiality it deserves. In order to get the process started, I would require that you contact me immediately on this email or Telephone/Fax numbers as given above with all necessary contact information of yourself. I have reposed my confidence in you and hope that you will not disappoint me. NOTE: If however, you are not disposed to assist, kindly delete/destroy this email in view of the confidentiality of the proposed transaction and interest of personalities involved. THIS MESSAGE MIGHT MEET YOU IN UTMOST SURPRISE. HOWEVER, IT'S JUST MY URGENT NEED FOR FOREIGN PARTNER THAT MADE ME TO CONTACT YOU FOR THIS TRANSACTION. I AM A BANKER BY PROFESSION FROM BURKINA FASO IN WEST AFRICA AND CURRENTLY HOLDING THE POST OF FOREIGN REMMITTANCE DIRECTOR IN OUR BANK. Compliments of the season and God's blessings. I am glad to inform you that I have successfully transferred the funds under the co-operation of a new partner from Paraguay .And presently am in Paraguay for some investment projects and medical check up with my own share of the total sum. as you should understand that during the period of processing the transfer that my health situation was very poor. And ask him to send you the total sum of $1.2 MILLION AMERICA DOLLARS which I kept for you, for your compensation for all the past efforts and attempts to assist me in this matter as I am a very strong and born again christian and will never easily forget all your passt efforts to assist no matter that i was not able to get it conclude with you. I appreciated all your efforts at that time very much. So feel free and get in touched with my secretary Mr.Johnson Nebuwa and instruct him where to send the money to you. Please do let me know immediately you receive it so that we can share the joy after all the sufferies at that time. In the moment,I am very busy here because of the investment projects and my health which me and my new partners are having at hand. Finally, remember that I had forwarded instruction to my secretary on your behalf in respect to that matter as well, So feel free to get in touch with him in respect to that so that he will send the amount to you without any delay. URGENT BUSINESS TRANSACTION TO TRANSFER THE SUM OF $28.9 MILLION UNITED STATES DOLLARS INTO YOUR BANK ACCOUNT FOR BUSINESS INVESTMENT IN YOUR COUNTRY AFTER WHICH YOU WILL GET 25% OF THE TOTAL SUM,ALSO BE AWARE THAT YOU WILL GET ANOTHER 25% FROM THE PROFIT FROM THE INVESTMENT WHICH YOU WILL ACT AS THE FUND MANAGER. I AM MR MATHIN SMITH,THE DIRECTOR OF ADUIT AND ACCOUNTS WITH THE ECOWAS REGIONAL OFFICE IN BURKINA FASO.THE FUND IN QUESTION WAS DISCOVERED DURING THE ADUITING OF THE CONTRACT PAYMENT ACCOUNT OF THE COMMISSION.I THEREFORE SEEK FOR YOUR ASSISTANCE TO HAVE THE FUND TRANSFERED INTO YOUR BANK ACCOUNT FOR A JOINT BUSINESS INVESTMENT IN YOUR COUNTRY. NOTE THAT THIS FUND IS VERY FREE OF DRUG,TERRORIST FUND AND MONEY LAUNDERING OR ANOTHER OTHER RELATED ACTS.THIS FUND COMES FROM OVERINVOICED CONTRACTS SUM FROM GOVERNMENT AND ECOWAS PROJECTS WHICH THE PRINCIPAL CONTRACT SUM HAS BEEN PAID TO THE CONTRACTOR LEAVING THE OVERINOICED SUM OF $28.9M USD. IF YOU ARE INTERESTED IN THIS TRANSACTION ,DO CALL ME ON MY PHONE NUMBER OR SEND AN EMAIL TO MY EMAIL WITH YOUR FULL NAMES,ADDRESS,PHONE AND FAX NUMBERS,OCCUPATION FOR MORE DETAILS AND HOW TO TRANSFER THE FUND INTO YOUR BANK ACCOUNT.PLEASE DO REPLY THROUGH EMAIL AND ALSO CALL ME: 226 78 08 26 16 . FROM THE DESK OF MRS AKA. TRUSTING TO HEAR FROM YOU SOONEST. HOW ARE YOU, FIRST I WILL EXPLAIN MY SELF IN BRIEF FOR YOU BEFORE WE PROCEED. I AM THE MANAGER OF BILL AND EXCHANGE AT THE FOREIGN REMITTANCE DEPARTMENT OF BANK OF AFRICA (BOA) I AM WRITING TO SEEK YOUR INTEREST OVER A BUSINESS , IN MY DEPARTMENT WE DISCOVERED AN ABANDONED SUM OF $30M US DOLLARS ( THIRTY MILLION US DOLLARS). 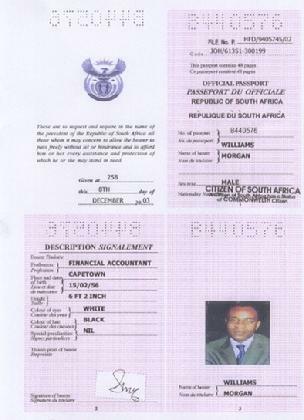 I AM MR BLESSD WILLIAMS THE BILL AND EXCHANGE MANAGER AT THE FOREIGN REMITTANCE DEPARTMENT OF BANK OF AFRICA. I GOT YOUR CONTACT FROM THE INTERNET ,WHILE SEACHING FOR AN HONEST AND TRUST WORTHY PERSON, WHO WILL ASSIST ME TO IMPLEMENT THIS TRANSFER. I DISCOVERED THE SUM OF TWENTY TWO MILLION AND FIVE HUNDRED THOUSAND UNITED STATES DOLLARS (USD22.5M) BELONGING TO A DECEASED CUSTOMER OF THIS BANK. THE FUND HAS BEEN LYING IN A SUSPENCE ACCOUNT WITHOUT ANYBODY COMING TO PUT CLAIM OVER THE MONEY SINCE THE ACCOUNT OWNER LATE MR SALLA KHATIF FROM LEBANESE, WHO WAS INVOLVED IN THE DECEMBER 25TH 2003 BENIN PLANE CRASH. HE SAID FUND IS NOW READY FOR TRANSFER TO A FORIEGN ACCOUNT WHOSE OWNER WILL BE PORTRAYED AS THE BENEFICIARY AND NEXT OF KIN TO THE DECEASED CUSTOMER OF THE BANK. SINCE WE GOT INFORMATION ABOUT HIS DEATH, WE HAVE BEEN EXPECTING HIS NEXT IF KIN TO COME OVER AND CLAIM HIS MONEY BECAUSE WE CANNOT RELEASE IT UNLESS SOMEBODY APPLIES FOR IT AS NEXT OF KIN OR RELATION TO THE DECEASED AS INDICATED IN OUR BANKING GUIDLINES AND LAWS BUT UNFORTUNATELY WE LEARNT THAT ALL HIS SUPPOSED NEXT OF KIN OR RELATION DIED ALONGSIDE WITH HIM AT THE PLANE CRASH LEAVING NOBODY BEHIND FOR THE CLAIM. THE BANKING LAW AND GUIDLINE HERE STIPULATES THAT IF SUCH MONEY REMAINED UNCLAIMED AFTER FIVE YEARS, THE MONEY WILL BE TRANSFERED INTO THE BANK TREASURY AS UNCLAIMED FUND. THE REQUEST OF FOREIGNER AS NEXT OF KIN IN THIS BUSINESS IS OCCASSIONED BY THE FACT THAT THE CUSTOMER WAS A FOREIGNER AND A BURKINABE CANNOT STAND AS NEXT OF KIN TO A FOREIGNER. I THEREFORE SOLICITING FOR YOUR ASSISTANCE TO COME FORWARD AS THE NEXT OF KIN. I HAVE AGREED THAT 40% OF THIS MONEY WILL BE FOR YOU AS THE BENEFICIARY IN RESPECT OF THE PROVISION OF YOUR ACCOUNT AND SERVICES RENDERED, 55% WOULD BE FOR ME WHILE 5% WILL BE FOR EXPENCSES INCURED DURING THE CAUSE OF THIS TRANSACTION IF THE MONEY IS TRANSFERRED TO YOUR ACCOUNT FROM BANK OF AFRICA, I AND MY FAMILY IN THIS TRANSACTION WILL PROCEED IMMEDIATELY TO YOUR COUNTRY FOR OUR OWN SHARE OF THE MONEY. I EXPECT YOU TO KEEP THIS BUSINESS STRICTLY CONFIDENTIAL AND SECRET AS YOU MAY WISH TO KNOW THAT I AM BANK OFFICIAL. BE REST ASSURED THAT THIS BUSINESS IS 100% RISK FREE ON BOTH SIDE AND EVERY ARRANGEMENT TO TRANSFER THIS MONEY TO THE ACCOUNT YOU ARE GOING TO PROVIDE HAVE BEEN CONCLUDED PROVIDED WE MAINTAIN THE CONFIDENTIALITY AND SECRECEIRITY INVOLVED. I AM LOOKING FORWARD FOR YOUR PROMPT RESPONSE. FROM THE DESK OF MR NAWAF SAAD. I AM WRITTING TO SEEK YOUR COPERATION OVER THIS BUSINESS DEAL. IN MY DEPARTMENT, I DISCOVERED AN ABANDONED SUM OF$30MILLION USD (THIRTYMILLION US DOLLARS) ONLY , IN AN ACCOUNT THAT BELONGS TO ONE OF OUR FOREIGN CUSTOMERS WHO DIED ALONG WITH HIS ENTIRE FAMILY IN A PLANE CRASH THAT TOOK PLACE IN KENYA,EAST AFRICA,THE LATE DR. GEORGE BRUMLEY, A CITIZEN OF ATLANTA,UNITED STATES OF AMERICA BUT NATURALISED IN BURKINAFASO,WEST AFRICA AND CONTRACTOR WITH ECOWAS,(ECONOMIC COMMUNITY OF WEST AFRICAN STATES) . SINCE WE GOT INFORMATION ABOUT HIS DEATH, WE HAVE BEEN EXPECTING HIS NEXT OF KIN TO COME OVER AND CLAIM HIS MONEY BECAUSE IT CANNOT BE RELEASED UNLESS SOMEBODY APPLIES FOR IT AS NEXT OF KIN OR RELATION TO THE DECEASED AS INDICATED IN OUR BANKING GUIDELINES BUT UNFORTUNATELY , ALL HIS SUPPOSED NEXT OF KIN OR RELATION DIED ALONGSIDE WITH HIM AT THE PLANE CRASH LEAVING NOBODY BEHIND FOR THE CLAIM. IT IS THEREFORE UPON THIS DISCOVERY THAT I NOW DECIDED TO MAKE THIS BUSINNESS PROPOSAL TO YOU AND RELEASE THE MONEY TO YOU VIA YOUR FOREIGN BANK ACCOUNT AS THE NEXT OF KIN OR RELATION TO THE DECEASED FOR SAFETY AND SUBSEQUENT DISBURSEMENT SINCE NOBODY IS COMING FOR IT AND THIS MONEY COULD GO INTO THE BANK TREASURY AS UNCLAIMED BILL. THE BANKING LAW AND GUIDELINE HERE STIPULATES THAT IF SUCH MONEY REMAINEDUNCLAMED AFTER FOUR YEARS, THE MONEY WILL BETRANSFERED INTO THE BANK TREASURY AS UNCLAIMED FUND.THE REQUEST FOR YOUR ASSISTANCE AND MAXIMUM CO-OPERATION AS A FOREIGN CITIZEN TO STAND AS THE NEXT OF KIN IN THIS BUSINESS IS OCCASIONED BY THE FACT THAT THE DECEASED CUSTOMER WAS A FOREIGNER AND A BURKINABE CANNOT STAND AS NEXT OF KIN TO A FOREIGNER. 40 % OF THIS MONEY WILL BE FOR YOU AS MY FOREIGN PARTNER, INRESPECT TO THE PROVISION OF A FOREIGN ACCOUNT. 10 %WILL BE SET ASIDE FOR EXPENCES INCURED DURING THE BUSINESS AND 50 % WOULD BE FOR ME.THERE AFTER I WILL COME OVER TO YOUR COUNTRY FOR DISBURSEMENT ACCODING TO THE PERCENTAGES INDICATED. THEREFORE TO ENABLE THE IMMEDIATE TRNANSFER OF THIS FUND TO YOU AS ARRANGED,YOU MUST APPLY FIRST TO THE BANK AS THE RELATION OR NEXT OF KIN TO THE DECEASED,INDICATING YOUR CLAIMS AND WHEREIN THE MONEY WILL BE REMITTED . REMITTANCE DIRECTOR OF THE BANK OF AFRICA. I WILL NOT FAIL TO BRING TO YOUR NOTICE THAT THIS TRANSACTION IS STRICLY CONFIDENTIAL AND I WILL USE MY POSITION IN THIS BANK TO EFFECT A HITCH FREE TRANSFER OF THE FUND. With Due Respect,I am the manager of bill and exchange at the foreign remittance department of african development bank (BOA).I crave your indulgence as i contact you in such a surprising manner. But I respectfully insist you read this letter carefully as I am optimistic it will open doors for unimaginable financial rewards for both of us. In my department we discovered an abandoned sum of Eleven Million,Three Hundred Thousand US dollars (US$11.3m) only , in an account that belongs to one of our foreign customer who died along with his entire family in a plan crash. Upon receipt of your reply,I will send to you by fax or email the text of the application.I will not fail to bring to your notice that this transaction is hitch free and that you should not entertain any atom of fear as all required arrangements have been made for the transfer. I need a capable and able person who will handle and manage this funds because it is not a small amount of project. You should contact me immediately as soon as you receive this letter. I am Barrister Williams Falana a member of Nigeria Bar Association (NBA).Your contact reached me through the World Business Encyclopedia. Hence, I made up my mind to introduce this business to you in confidence for the mutual benefit of both of us. campaign. Because I was his family Attorney as such he confided in me with the relevant document papers relating to this Bank before he died of cardiac arrest. As a matter of fact, I have adequately agreed with some of the key officers of the private Bank to negotiate with you a trustworthy person to provide an account where this money could be transferred to your country through your Bank account, because we cannot claim the money here in Nigeria. expenses, and 75% for us. You are required to send by e-mail immediately your Telephone and Fax numbers and Bank particulars where this money will be lodged and your personal contact address. Once you notify me your willingness by sending the above requirement. This transaction will be concluded within 10 (ten) working days. I will be waiting for your urgent reply.